In June 2016 we reached Cape Agulhas in South Africa, the southernmost tip of Africa. The local newspaper "2 Oseane Nuus" published two articles on us, one in Afrikaans (16th June) and one in English (29th June). Cape Agulhas to us is one of our favourite places in Africa - much less touristy that the more "famous" Cape of Good Hope. Christmas 2015 - Video: DaCaLuF - Saison2 - Ep60 - Joyeux Noël ... Meeting up with other overland families in Kilifi, Kenya. On the Website of the Explorer Magazin we post blog entries and articles in German ... more. July 2015 - Purpose-built for extended travel, this Defender is not your average family vehicle. Karin-Marijke's and Coen's ("Landcruising Adventure") Overland Reunion 2015 was the second time for us at this wonderfully relaxed overlander's meeting. It was great to meet so many old friends again and make loads of new friends as well! ... more. On the Website of Reise Know-How Publishing we post information, reports, blog entries, interviews et cetera in German ... more. The "Spiekerooger Inselbote" is the local newspaper on our home-island of Spiekeroog (more or less just a little sandbank in the North Sea). A short article on our planned Ethiopian Winter was published in the Christmas edition. The Overland Reunion was the first overlander's meeting we attended. We really enjoyed the time spent in Twente, The Netherlands. Coen Wubbels and Karin-Marieke Vis report on this event on their blog "Landcruising Adventure". Also see our gallery. 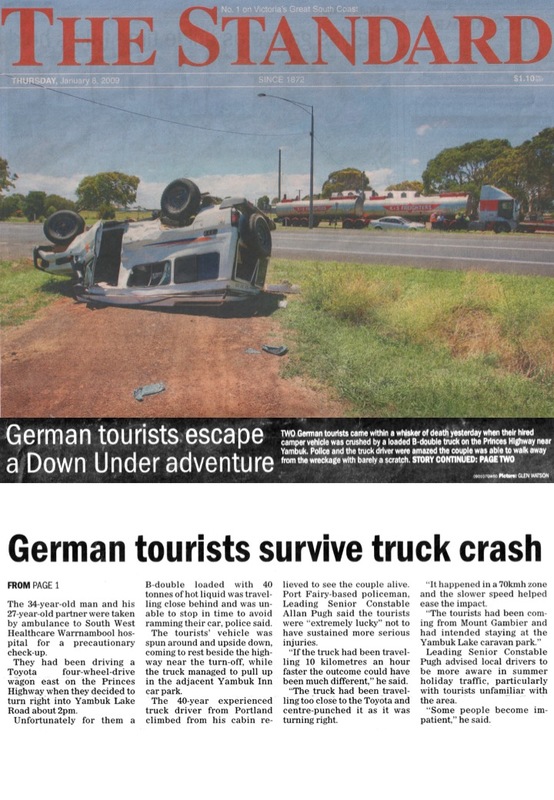 In January 2009, Juliane and Mischa survived a car crash in Australia that could have easily become fatal. The next morning, we discovered that we had become "famous" because the crash was on the front page of the local newspaper "The Standard".